Our customers consistently rate the Hotel Lorenzetti as one of their favourites. The combination of the wonderful surroundings, fantastic food, its friendly and helpful staff, and an unbeatable setting means that many choose to return year after year. Our 2018 walking weeks comprise 4 walks set within the stunning scenery of the Dolomite Mountains, giving you the chance to savour their spectacular landscapes and the pure mountain air that this region is famous for. Starting from Cascina Zeledria, we walk to Pradalago where we will pause for a coffee break. Refreshed, we will take the path to the glorious setting of Lago Malghette where we will have lunch in a restaurant by the lake. After lunch (not included) we will walk back to Madonna di Campiglio, or take the hotel’s shuttle bus if your legs fancy a rest. Starting from Campo Carlo Magno we take the path to beautiful Lago Nambino. After a coffee stop we will continue to Malga Ritorto where we will have lunch in the restaurant, or buy plates of delicious hams and cheeses from the Farm Shop. After lunch we’ll take a leisurely walk back down to the hotel. If you fancy venturing further afield, head to Riva del Garda and the ferry to Malcesine or Limone to enjoy the atmosphere of Lake Garda, or visit the charming Italian town of Trento. Walking in the valley behind the hotel, we cross the river and then take the path to Cascate Media where we will stop for coffee. We continue to Cascate Alta and after walking up the side of this beautiful waterfall we will continue to Rifugio Vallesinella where we will have lunch (not included). After lunch we will take a leisurely winding walk back down to the hotel. Combining the comfort and informality of a family-run hotel with elegance and sophistication, this hotel entices its guests to return time after time. The food here is magnificent and each evening we enjoy a wonderful multi-course dinner in the beautiful restaurant and then unwind in the cosy bar. Facilities include an indoor heated swimming pool, jacuzzi and tepidarium as well as a wellness centre which offers a sauna and steam room (extra charge). All of the guest rooms have a shower, telephone, TV, minibar and hairdryer. The transfer time from Verona Airport to Hotel Lorenzetti is approximately 2.5 hours, depending on traffic and road conditions. Four full day guided walks are included in the programme. The walking programme is graded as easy-medium and you can expect to walk between 13 - 15km per day, with some ascents/descents, rough underfoot terrain and high altitudes involved. The altitude of the hotel is 1,300m and the highest you can go in a cabin lift is 2,500m. Although at these altitudes there is a very low risk of being affected by Acute Mountain Sickness, a number of medical conditions can also reduce your body’s ability to acclimatise, and could make you more susceptible to AMS. If you are worried about any pre-existing condition (e.g. heart problems), or unsure of your physical ability, we recommend that you seek medical advice. There are two options for this trip. Walking there with a local Alpine guide on an organised walk (medium difficulty) and then bus back to the hotel . Or simply take the bus there and back. Approx cost: €20 per person. 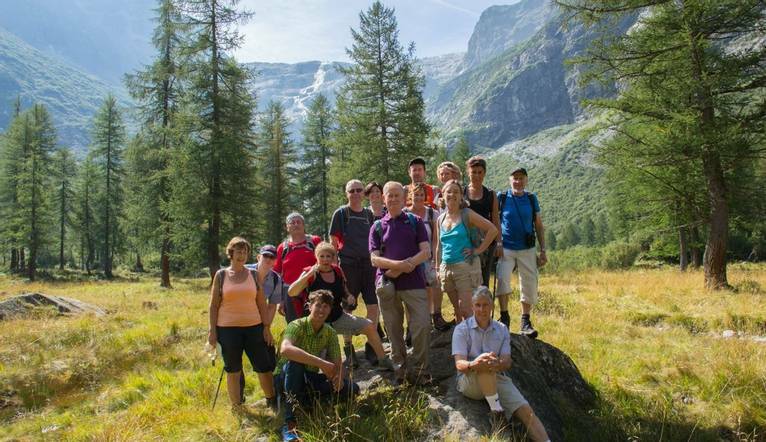 There are also complimentary guided walks offered by the local Alpine guides. These full day walks are easy to medium level. Different walks are offered each week. They can be booked through the hotel who can also provide a packed lunch (extra cost). Other walks are available each week at a cost of approximately €25 per person. We suggest a Group Collection to cover transfer drivers, and hotel staff of €20 per person. Your Tour Leader will collect this on your behalf and distribute it accordingly, thus relieving you of the burden of who, when and how much to tip. The tipping of housekeeping will be left to your individual discretion (a small amount left in your room on departure should cover this and would be much appreciated). As is customary, ‘the hat’ will be passed around for the driver and guide on all optional excursions. For any meals that are not included in your itinerary, or taxi fares, your Tour Leader can advise of an appropriate add on.